I have a set of ~13K SNPs across 16 individuals, 8 from each of two different species. Individuals were sequenced in two different sequencing runs. I am using the R package SNPRelate to calculate relatedness between pairs and to visualize the individuals in PCA space. The problem is that PCA is separating not only by species but also by sequencing run. This pattern persists even if I remove SNPs that are missing in many individuals. 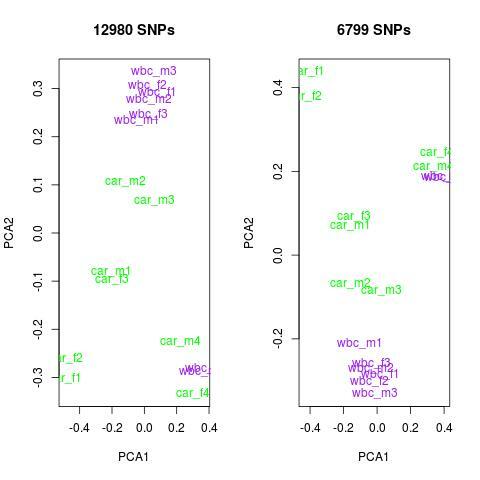 I would like to find the particular SNPs that are separating the different sequencing runs and remove them from analyses. Any suggestions on finding the SNPs that are contributing to this pattern?